From CJ’s mother: There are no words that a Mother can say about losing her only son in a tragic accident. I will say this, he was handsome, very smart and has never made this Mom worry. Thoughtful, accommodating to his Mom, even if after a very hard week of out of town working, he would agree to Mom’s request to drive over just to get a hug. He was a pleasure to raise and never broke a promise. He was so special to his sister, had a great daily relationship with his Dad as well. We all will miss him daily. His Father and I did what he and his sister decided to do, sign up to help others in need. We think now he is proud of us. Like all Moms, this is the worst thing that can happen. Miss and Love you forever Handsome (CJ). From CJ’s sister: My brother tragically passed in February 2016 at the age of 29. He was just married in May 2015 and just began to start his life as a “family man”. He was the best brother and son and husband anyone could ever ask for. Even though his passing was sudden and tragic, he was able to save the lives of others through being a donor. He was a hero in life and continues to be a hero in other lives. I will always love and miss you brother! Become a part of Charles “CJ” Keen's story. Click Here. 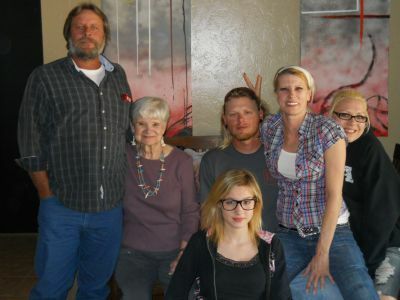 This was the most recent family photo. This was a perfect day in his new home. To me you were more than an Uncle, you were truly a great friend. You've made me laugh, Like no one I have ever met You had the best laugh ever Most of the time you're laugh was funnier than the joke Whenever I'm upset I know you're there with a shoulder to cry on. Whenever I face a problem and need some help I know you are one I can rely on. You've always made me happy, Even though you were mean to me and made fun of my pimples, You're more than just an Uncle, you're also a great friend to me.